The four Turner sisters agree on very few things, but on one point they’re in accord: none of them has any interest in performing. Nell is happily married with a baby of her own; 13-year-old Kit’s greatest wish is to stop growing taller; Winnie’s love of learning has her yearning for college; and Gert knows that she wants to live a better life than her mother’s. In 1919, the Turners are barely scraping by. When their father loses his job and their tenuous place barely above the poverty line is threatened, their mother decides to enter her family into the world of vaudeville. Traveling by train from town to town, the Turner women find a new kind of freedom in the company of performers who are diverse as their acts. Along the way, the Turners face dangers and turns of fate for which they could never have prepared. 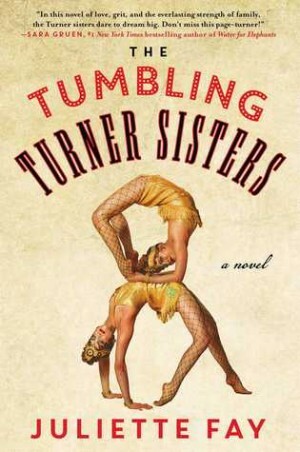 Told in turn by shy Winnie and headstrong Gert, THE TUMBLING TURNER SISTERS (Gallery Books; June 14, 2016; Hardcover; $24.99) is a story of awakening – to unexpected possibilities, to love and heartbreak, and to the dawn of a New American era. **Shelter Me, Juliette’s first published novel, was designated as one of the ten best works of fiction in 2009 by the MA Center for the Book. **Shelter Me was named to the Indie Next List of the American Booksellers Association. **Deep Down True, Juliette’s second novel, was short-listed for the Women’s Fiction Award of the American Library Association. **The Shortest Way Home, Juliette’s third novel, was chosen as one of Library Journal’s Top 5 BEST BOOKS of 2012: Women’s Fiction. —Nichole Bernier, author of The Unfinished Work of Elizabeth D.
GALLERY BOOKS is an imprint dedicated to publishing a variety of must-read books on a wide array of topics. Launched in February 2010, Gallery is designed to showcase established voices and to introduce emerging new ones—in both fiction and nonfiction genres. Some of Gallery Books’ bestselling titles include Tim Gunn’s Fashion Bible by Tim Gunn, Are You There, Vodka? It’s Me Chelsea by Chelsea Handler, Uncharted TerriTORI by Tori Spelling, Love Anthony by Lisa Genova, Mrs. Kennedy and Me by Clint Hill, The Tucci Cookbook by Stanley Tucci, and The Untold History of the United States by Oliver Stone and Peter Kuznick.